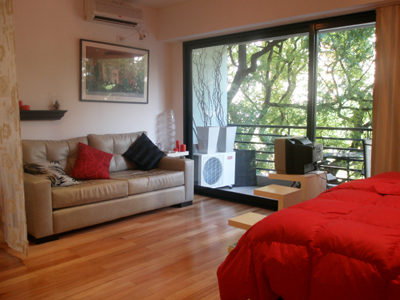 Upscale and affordable one room apartment located in a brand new building in Palermo, 100 mtrs away from the famous Libertador Av., one of the most beautiful places to stay in Buenos Aires. This delightful apartment offers a quiet and relaxing environment. The bedroom area has a king size bed that can be divided into two large beds and exit to the balcony. The living area is very comfortable with a leather sofa, aircond hot/cold, cable TV and Wi Fi Internet access. The dining area offers a small table for two. There is also a fully equipped kitchen open to living room with a breakfast bar. The bathroom is complete with shower and bathtub. The apartment also has washer & dryer machine. The building has a comunal swimming pool for summer season, solarium and BBQ area.